A variety of Turkish dishes on a "sini", or large tray, that was formerly used in the rural areas as a traditional alternative to a table. Turkish cuisine (Turkish: Türk mutfağı) is largely the heritage of Ottoman cuisine, which can be described as a fusion and refinement of Central Asian, Middle Eastern, Eastern European and Balkan cuisines. Turkish cuisine has in turn influenced those and other neighbouring cuisines, including those of Southeast Europe (Balkans), Central Europe, and Western Europe. The Ottomans fused various culinary traditions of their realm with influences from Levantine cuisines, along with traditional Turkic elements from Central Asia (such as yogurt and mantı), creating a vast array of specialities. Turkish cuisine varies across the country. The cooking of Istanbul, Bursa, Izmir, and rest of the Asia Minor region inherits many elements of Ottoman court cuisine, with a lighter use of spices, a preference for rice over bulgur, koftes and a wider availability of vegetable stews (türlü), eggplant, stuffed dolmas and fish. The cuisine of the Black Sea Region uses fish extensively, especially the Black Sea anchovy (hamsi) and includes maize dishes. The cuisine of the southeast (e.g. Urfa, Gaziantep, and Adana) is famous for its variety of kebabs, mezes and dough-based desserts such as baklava, şöbiyet, kadayıf, and künefe. Especially in the western parts of Turkey, where olive trees grow abundantly, olive oil is the major type of oil used for cooking. The cuisines of the Aegean, Marmara and Mediterranean regions are rich in vegetables, herbs, and fish. Central Anatolia has many famous specialties, such as keşkek, mantı (especially from Kayseri) and gözleme. Food names directly cognate with mantı are found also in Chinese (mantou or steamed bun) and Korean cuisine (mandu). A specialty's name sometimes includes that of a city or region, either in or outside of Turkey, and may refer to the specific technique or ingredients used in that area. For example, the difference between Urfa kebap and Adana kebap is the thickness of the skewer and the amount of hot pepper that the kebab contains. Urfa kebap is less spicy and thicker than Adana kebap. Although meat-based foods such as kebabs are the mainstay in Turkish cuisine as presented in foreign countries, native Turkish meals largely center around rice, vegetables, and bread. Simit, a circular bread with sesame seeds, is a common breakfast item in Turkey. Turks usually prefer a rich breakfast. A typical Turkish breakfast consists of cheese (beyaz peynir, kaşar etc. ), butter, olives, eggs, tomatoes, cucumbers, jam, honey, and kaymak, sucuk (spicy Turkish sausage, can be eaten with eggs), pastırma, börek, simit, poğaça and soups are eaten as a morning meal in Turkey. A specialty for breakfast is called menemen, which is prepared with tomatoes, green peppers, onion, olive oil and eggs. Invariably, Turkish tea is served at breakfast. The Turkish word for breakfast, kahvaltı, means "before coffee" (kahve, 'coffee'; altı, 'under'). Homemade food is still preferred by Turkish people. Although the newly introduced way of life pushes the new generation to eat out; Turkish people generally prefer to eat at home. A typical meal starts with soup (especially in wintertime), followed by a dish made of vegetables or legumes boiled in a pot (typically with meat or minced meat), often with or before rice or bulgur pilav accompanied by a salad or cacık (diluted cold yogurt dish with garlic, salt, and cucumber slices). In summertime many people prefer to eat a cold dish of vegetables cooked with olive oil (zeytinyağlı yemekler) instead of the soup, either before or after the main course, which can also be a chicken, meat or fish plate. Although fast food is gaining popularity and many major foreign fast food chains have opened all over Turkey, Turkish people still rely primarily on the rich and extensive dishes of Turkish cuisine. In addition, some traditional Turkish foods, especially köfte, döner, kokoreç, kumpir midye tava börek and gözleme, are often served as fast food in Turkey. Eating out has always been common in large commercial cities. Esnaf lokantası (meaning restaurants for shopkeepers and tradesmen) are widespread, serving traditional Turkish home cooking at affordable prices. In the hot Turkish summer, a meal often consists of fried vegetables such as eggplant (aubergine) and peppers or potatoes served with yogurt or tomato sauce. Menemen and çılbır are typical summer dishes, based on eggs. Sheep cheese, cucumbers, tomatoes, watermelons and melons also make a light summer meal. Those who like helva for dessert prefer summer helva, which is lighter and less sweet than the regular one. Frequently used ingredients in Turkish specialties include: lamb, beef, rice, fish, eggplants, green peppers, onions, garlic, lentils, beans, zucchinis and tomatoes. Nuts, especially pistachios, chestnuts, almonds, hazelnuts, and walnuts, together with spices, have a special place in Turkish cuisine, and are used extensively in desserts or eaten separately. Semolina flour is used to make a cake called revani and irmik helvasi. Ground sumac can be used to season salads, rice and soups. A spice mix of sumac, dried thyme and roasted sesame seeds is used with grilled meats. Olives are also common on various breakfasts and meze tables frequently. Beyaz peynir and yogurt are part of many dishes including börek, manti, kebab and cacik. Butter or margarine, olive oil, sunflower oil, canola oil, and corn oil are widely used for cooking. Sesame, hazelnut, peanut and walnut oils are used as well. Kuyruk yağı (tail fat of sheep) is sometimes used in kebabs and meat dishes. The rich and diverse flora of Turkey means that fruit is varied, abundant and cheap. In Ottoman cuisine, fruit frequently accompanied meat as a side dish. Plums, apricots, pomegranates, pears, apples, grapes, and figs, along with many kinds of citrus are the most frequently used fruit, either fresh or dried, in Turkish cuisine. For example, komposto (compote) or hoşaf (from Persian khosh âb, literally meaning "nice water") are among the main side dishes to meat or pilav. Dolma and pilaf usually contain currants or raisins. Etli yaprak sarma (vine leaves stuffed with meat and rice) used to be cooked with sour plums in Ottoman cuisine. Turkish desserts do not normally contain fresh fruit, but may contain dried varieties. Eggplant (Turkish: patlıcan) has a special place in the Turkish cuisine. In some regions, meat, which was mostly eaten only at wedding ceremonies or during the Kurban Bayramı (Eid ul-Adha) as etli pilav (pilaf with meat), has become part of the daily diet since the introduction of industrial production. Veal, formerly shunned, is now widely consumed. The main use of meat in cooking remains the combination of ground meat and vegetable, with names such as kıymalı fasulye (beans with ground meat) or kıymalı ıspanak (spinach with ground meat, which is sometimes served with yogurt). Alternatively, in coastal towns cheap fish such as sardalya (sardines) or hamsi (anchovies) are widely available, as well as many others with seasonal availability. Poultry consumption, almost exclusively of chicken and eggs, is common. Milk-fed lambs, once the most popular source of meat in Turkey, comprise a small part of contemporary consumption. Kuzu çevirme, cooking milk-fed lamb on a spit, once an important ceremony, is rarely seen. Yogurt is an important element in Turkish cuisine. In fact, the English word yogurt or yoghurt derives from the Turkish word yoğurt. Yogurt can accompany almost all meat dishes (kebabs, köfte), vegetable dishes (especially fried eggplant, courgette, spinach with minced meat etc. 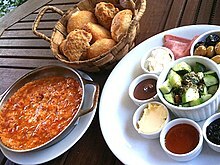 ), meze and a specialty called mantı (folded triangles of dough containing minced meat). In villages, yogurt is regularly eaten with rice or bread. A thicker, higher-fat variety, süzme yoğurt or "strained yogurt", is made by straining the yogurt curds from the whey. 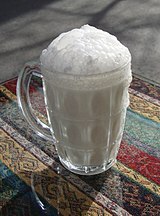 One of the most common Turkish drinks, ayran, is made from yogurt. Also, yogurt is often used in the preparation of cakes, some soups and pastries. Beyaz peynir is a salty brined cheese taking its name from its white color ("white cheese"). It is similar to feta but not as strong. This is produced in styles ranging from unmatured cheese curds to a quite strong mature version. It has many varieties due to source of milk, region (Ezine or Thrace) and production methods (classic or cultured). It is eaten plain (e.g. as part of the traditional Turkish breakfast), used in salads, and incorporated into cooked foods such as menemen, börek and pide. 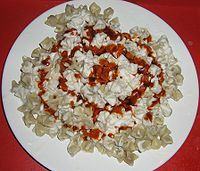 Çökelek is dried cottage cheese. There are many regional varieties of çökelek. Some are eaten fresh while others are preserved, either by storage in goatskin bags or pottery jars, or by drying in the sun. Kurut and keş are regional names for dried bricks of yogurt made from low-fat milk or from çökelek made from buttermilk. Gravyer is produced in Turkey as well. Among others, Kars is famous for this type of cheese. Hellim is a salty, firm-textured goat cheese, generally with some mint added, made in Northern Cyprus. In Turkey, it is common to fry hellim in a pan in some olive oil. Kaşar is Turkey's other ubiquitous cheese, a moderately fatty sheep's cheese similar to the Greek kasseri, sometimes marketed as "Turkish cheddar", being closer in consistency and taste to mild cheddar-style cheese than other Turkish cheeses. Less matured kaşar, called fresh kaşar, is widely consumed as well. Two varieties are popular Kars and Thrace. Kaşkaval is a wheel-shaped yellow sheep's cheese, similar to fresh kaşar. The name comes from Romanian word cașcaval, which bears the Italian structure of caciocavallo. Mihaliç peyniri or Kelle peyniri is a hard sheep's cheese that can be grated, like Parmesan cheese. Sometimes goat or cow milk is used. It is a specialty from Karacabey, a town in Bursa province which was called Mihaliç during Byzantine and Ottoman period. Mostly it is produced from non-pastorized milk and processed by salt. Örgü peyniri, "braided cheese", is a specialty from Diyarbakır. Otlu peynirVan herbed cheese ("herbed cheese") is produced in many areas, chiefly in East Anatolia. Traditionally sheep's or goat's milk is used, but more recently cow's milk otlu peynir has been produced. The type of herb used varies by region: in Van wild garlic is traditional; Bitlis otlu peynir contains a damp-loving herb known as sof otu. In other areas horse mint (Mentha longifolia) and Pimpinella rhodentha are used. Tulum is a mostly sheep's curd molded in an animal skin bag called as tulum. There are regional varieties of tulum peynir in such areas as İzmir, Ödemiş and Erzincan. And each of tulum cheese have very different characteristics. Tuzlama, a tripe soup from Turkey. Simit (known as "gevrek" in Izmir, another type of ring-shaped bread covered with sesame seeds. Simit is commonly eaten in Turkey, plain or with cheese, butter or marmalade). Yufka a round and flat bread, made of wheat flour, thinner than pide. Turkish cuisine has a range of savoury and sweet pastries. Dough based specialties form an integral part of traditional Turkish cuisine. The use of layered dough is rooted in the nomadic character of early Central Asian Turks. The combination of domed metal sač and oklava (the Turkish rod-style rolling pin) enabled the invention of the layered dough style used in börek (especially in su böreği, or 'water pastry', a salty baklava-like pastry with cheese filling), güllaç and baklava. Börek is the general name for salty pastries made with yufka (a thicker version of phyllo dough), which consists of thin layers of dough. Su böreği, made with boiled yufka/phyllo layers, cheese and parsley, is the most frequently eaten. Çiğ börek (also known as Tatar böreği) is fried and stuffed with minced meat. Kol böreği is another well-known type of börek that takes its name from its shape, as do fincan (coffee cup), muska (talisman), Gül böreği (rose) or Sigara böreği (cigarette). Other traditional Turkish böreks include Talaş böreği (phyllo dough filled with vegetables and diced meat), Puf böreği. Laz böreği is a sweet type of börek, widespread in the Black Sea region. Poğaça is the label name for dough based salty pastries. Likewise çörek is another label name used for both sweet and salty pastries. Gözleme is a food typical in rural areas, made of lavash bread or phyllo dough folded around a variety of fillings such as spinach, cheese and parsley, minced meat or potatoes and cooked on a large griddle (traditionally sač). Katmer is another traditional rolled out dough. It can be salty or sweet according to the filling. Katmer with pistachio and kaymak is a sweet food and one of the most popular breakfast items in Gaziantep. 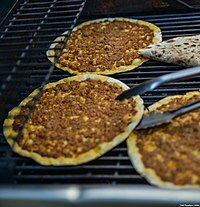 Lahmacun (meaning dough with meat in Arabic) is a thin flatbread covered with a layer of spiced minced meat, tomato, pepper, onion or garlic. Pide, which can be made with minced meat (together with onion, chopped tomatoes, parsley and spices), kashar cheese, spinach, white cheese, pieces of meat, braised meat (kavurma), sucuk, pastırma or/and eggs put on rolled-out dough, is one of the most common traditional stone-baked Turkish specialities. Açma is a soft bread found in most parts of Turkey. It is similar to simit in shape, is covered in a glaze, and is usually eaten as a part of breakfast or as a snack. Mantı with yogurt and garlic, spiced with red pepper powder and melted butter. Typical Turkish pilav. Rice with orzo. Sade pilav Plain rice pilaf is often the primary side dish to any meal. It is made by sauteing rice with butter until lightly toasted and simmering with water or stock. Acem pilavı Persian pilaf rice with lamb, cooked in meat broth with pistachios, cinnamon, etc. Bulgur pilavı a cereal food generally made of durum wheat. Most of the time, tomato, green pepper and minced meat are mixed with bulgur. The Turkish name (bulgur pilavı) indicates that this is a kind of rice but it is, in fact, wheat. Hamsili pilav spiced rice covered with anchovies, cooked in oven. A speciality from the Black Sea Region. Frik pilavı rice made of burnt wheat. A speciality from Antioch/Antakya. Mantı Turkish pasta that consists of folded triangles of dough filled with minced meat, often with minced onions and parsley. It is typically served hot topped with garlic yogurt and melted butter or warmed olive oil, and a range of spices such as oregano, dried mint, ground sumac, and red pepper powder. The combination of meat-filled dough with yogurt differentiates it from other dumplings such as tortellini, ravioli, and Chinese wonton. Mantı is usually eaten as a main dish. Minced chicken and quail meats are also used to prepare mantı in some regions of Turkey. Erişte homemade pasta is called erişte in Turkey. It can be combined with vegetables but it can also be used in soups and rice. A vegetable dish can be a main course in a Turkish meal. A large variety of vegetables are used, such as spinach, leek, cauliflower, artichoke, cabbage, celery, eggplant, green and red bell peppers, string bean and jerusalem artichoke. A typical vegetable dish is prepared with a base of chopped onions, carrots sautéed first in olive oil and later with tomatoes or tomato paste. The vegetables and hot water will then be added. Quite frequently a spoon of rice and lemon juice is also added. Vegetable dishes usually tend to be served with its own water (the cooking water) thus often called in colloquial Turkish sulu yemek (literally "a dish with juice"). Minced meat can also be added to a vegetable dish but vegetable dishes that are cooked with olive oil (zeytinyağlılar) are often served cold and do not contain meat. Spinach, leek, string bean and artichoke with olive oil are among the most widespread dishes in Turkey. Dolma is the name used for stuffed vegetables. Like the vegetables cooked with olive oil as described above dolma with olive oil does not contain meat. Many vegetables are stuffed, most typically green peppers (biber dolması), eggplants, tomatoes, or zucchini/courgettes (kabak dolması), vine leaves (yaprak dolması). If vine leaves are used, they are first pickled in brine. However, dolma is not limited to these common types; many other vegetables and fruits are stuffed with a meat or rice mixture. For example, artichoke dolma (enginar dolması) is an Aegean region specialty. Fillings used in dolma may consist of parts of the vegetable carved out for preparation, rice with spices or minced meat. Mercimek köfte, although being named köfte, does not contain any meat. Instead, red lentil is used as the major ingredient together with spring onion, tomato paste etc. Imam bayildi is a version of karnıyarık with no minced meat inside. It can be served as a meze as well. Fried eggplant and pepper is a common summer dish in Turkey. It is served with yogurt or tomato sauce and garlic. Mücver is prepared with grated squash/courgette or potatoes, egg, onion, dill or cheese and flour. It can be either fried or cooked in the oven. Pilaf can be served either as a side dish or main dish but bulgur pilavı (pilav made of boiled and pounded wheat - bulgur) is also widely eaten. The dishes made with kuru fasulye (white beans), nohut (chickpeas), mercimek (lentils), börülce (black-eyed peas), etc., combined with onion, vegetables, minced meat, tomato paste and rice, have always been common due to being economical and nutritious. Turşu is pickle made with brine, usually with the addition of garlic. It is often enjoyed as an appetizer. It is made with a large variety of vegetables, from cucumber to courgette. In the towns on the Aegean coast, the water of turşu is consumed as a drink. It comes from the Persian "Torshi", which refers to pickled "Torsh" (sour) vegetables. Menemen consists of scrambled eggs cooked in tomato, green pepper, and can be onion and garlic. Çılbır is another traditional Turkish food made with poached eggs, yogurt and oil. Ispanaklı yumurta consists of eggs with spinach and onion. Kaygana can be described as something of a cross between the pancake and the omelet in Ottoman cuisine. It used to be served with cheese, honey, crushed nuts, or eggplant. However, it is almost forgotten in the big cities of Turkey. A bowl of Cacık, the original form of seasoned, diluted yogurt with chopped cucumber, eaten throughout the former Ottoman world, under different names, like the tarator and tzatziki of the Balkans. Meze is a selection of food served as the appetizer course with or without drinks. Some of them can be served as a main course as well. Humus (from the Arabic for "chickpea") – a spread prepared from sesame tahini, chickpeas, garlic, olive oil, and lemon juice. Dolma is a verbal noun of the Turkish verb dolmak 'to be stuffed (or filled)', and means simply 'stuffed thing'. Sarma is also verbal noun of the Turkish verb sarmak 'to be wrapped (or hugged)', and means simply 'wrapped leafs'. Dolma and sarma has a special place in Turkish cuisine. It can be eaten either as a meze or a main dish. It can be cooked either as a vegetable dish or meat dish. If a meat mixture is put in, it is usually served hot with yogurt and spices such as oregano and red pepper powder with oil. If the mixture is only vegan recipe it should only have olive oil rice or bulgur and some nuts and raisins inside especially blackcurrant. Zeytinyağlı yaprak sarması (stuffed leafs with olive oil) is the sarma made with vine leaves stuffed with a rice-spice mixture and cooked with olive oil. This type of dolma does not contain meat, is served cold and also referred to as sarma, which means "wrapping" in Turkish. Dried fruit such as blackcurant; raisins, figs or cherries and cinnamon and allspice used to be added into the mixture to sweeten zeytinyağlı dolma in Ottoman cuisine. Vine leaves (yaprak) could be filled not only with rice and spices but also with meat and rice, etli yaprak sarma, in which case it was often served hot with yogurt. The word sarma is also used for some types of desserts, such as fıstık sarma (wrapped pistachio). A plate of Kuzu Güveç in Tapiola, Espoo, Finland. Consisted of chicken or lean veal, Döner kebap is a common Turkish fast food. Kavurma which means frying, roasting or parching in Turkish, is generally used for roasted lamb or a variety of fried meat dishes. Çoban kavurma is a variety of it, prepared with diced lamb with tomatoes, onions, mushrooms, peppers and herbs. Kavurma is one of the favorite dishes of Ramadan. Alinazik, a home-style Turkish kebab variety which is a specialty of the Gaziantep province. Köfte (meatball) is another meat dish in Turkey. The word köfte is sometimes preceded by the name of a town, which refers to the technique for cooking it or the ingredients or spices specifically used in that region, for example; İnegöl köftesi, İzmir köfte, Akçaabat köfte, pideli köfte (Bursa), Filibe köfte, Tire köfte, Islama köfte (mainly in Sakarya province) etc. Its main ingredients are minced meat, parsley, bread-egg (not necessarily, usually homemade köfte contains egg yolk and some crumbled bread) and a range of spices: cumin, oregano, mint powder, red or black pepper powder with onion or garlic. Kadınbudu köfte is another traditional speciality; minced meat is mixed with cooked rice and fried. Içli köfte can be described as a shell of "bulgur" filled with onion, minced meat and nuts. Çiğ köfte is a meze from south-eastern Turkey meaning raw meatballs, prepared with "bulgur" and raw minced meat. Terbiyeli Sulu Köfte is another meatball speciality cooked with flour, tomato paste and water in which lemon and egg sauce is added. Sucuk is a form of raw sausage (made with beef meat and a range of spices, and garlic) commonly eaten with breakfast. Instead of classical sausages (sosis), sucuk is the most used ingredient for snacks and fast-food style toasts and sandwiches in Turkey. Pastırma is another famous beef delicacy. Both pastırma and sucuk can be put in kuru fasulye (dry beans) to enrich the aroma. Both can be served as a meze as well. Sucuk or pastırma with scrambled eggs, served in a small pan called sahan, is eaten at breakfast in Turkey. Kokoreç (the intestines of sheep) with spices is a traditional low-price fast food in Turkey. Liver is fried in Turkish cuisine. "Arnavut ciğeri" (meaning Albanian liver), served with onion and sumac, is usually eaten as a meze, in combination with other mezes such as fava. "Edirne ciğeri" is another famous liver dish from Edirne. Liver is first frozen so that it can be cut into very thin layers. After being cut off, liver layers are fried. Alinazik kebab over garlic-eggplant puree with vermicelli rice pilaf, grilled tomato and green bell pepper. For a list of kebab variants, see List of kebabs. Kebab refers to a great variety of meat-based dishes in Turkish cuisine. Kebab in Turkey encompasses not only grilled or skewered meats, but also stews and casseroles. Adana kebap or kıyma kebabı – kebab with hand-minced meat mixed with chili on a flat wide metal skewer (shish); associated with Adana region although very popular all over Turkey. Ali Paşa kebabı, "Ali Pasha kebab" – cubed lamb with tomato, onion and parsley wrapped in phillo. Alinazik kebab – Ground meat kebab sautéed in a saucepan, with garlic, yogurt and eggplants added. Bahçıvan kebabı, 'gardener's kebab' – Boneless lamb shoulder mixed with chopped onions and tomato paste. Beyti kebab – Ground lamb or beef, seasoned and grilled on a skewer, often served wrapped in lavash and topped with tomato sauce and yogurt, traced back to the famous kebab house Beyti in İstanbul and particularly popular in Turkey's larger cities. Bostan kebabı – Lamb and aubergine casserole. Buğu kebabı, "steamed kebap" – cooked in low heat until the meat releases its moisture and reabsorbs it. Cağ kebab, 'spoke kebab' – Cubes of lamb roasted first on a cağ (a horizontal rotating spit) and then on a skewer, a specialty of Erzurum region with recently rising popularity. Ciğerli kağıt kebabı, 'liver paper kebab' – Lamb liver kebab mixed with meat and marinated with thyme, parsley and dill. Çardak kebabı, 'arbor kebab' – Stuffed lamb meat in a crêpe. Çökertme kebabı – Sirloin veal kebap stuffed with yogurt and potatoes. Çömlek kebabı, 'earthenware bowl kebab' – Meat and vegetable casserole (called a güveç in Turkish) with eggplant, carrots, shallots, beans, tomatoes and green pepper. Çöp şiş, "small skewer kebab" – a speciality of Selçuk and Germencik near Ephesus, pounded boneless meat with tomatoes and garlic marinated with black pepper, thyme and oil on wooden skewers. Hünkâri kebabı, 'Sultan's kebab' – Sliced lamb meat mixed with patlıcan beğendi (aubergine purée), basil, thyme and bay leaf. İskender kebap – döner kebap served with yogurt, tomato sauce and butter, originated in Bursa. The kebab was invented by İskender Efendi in 1867. He was inspired from Cağ kebab and turned it from horizontal to vertical. İslim kebabı, 'steamed kebab' – Another version of the aubergine kebab without its skin, marinated in sunflower oil. Kuyu kebabı, 'pit kebab' – Prepared from the goat it is special for Aydın region, similar to tandır kebabı. Kuzu incik kebabı, 'lamb shank kebab' – Lamb shanks mixed with peeled eggplants and chopped tomatoes, cream, salt and pepper. Kuzu şiş – Shish prepared with marinated milk-fed lamb meat. Köfte kebap or Shish köfte – minced lamb meatballs with herbs, often including parsley and mint, on a stick, grilled. Manisa kebabı – This Manisa region version of the kebab is smaller and flat size shish meat on the sliced pide bread, flavored with butter, and stuffed with tomato, garlic and green pepper. Orman kebabı, 'forest kebab' – Lamb meat on the bone and cut in large pieces mixed with carrots, potatoes and peas. Patates kebabı, 'potato kebab' – Beef or chicken mixed with potatoes, onions, tomato sauce and bay leaves. Patlıcan kebabı, 'aubergine kebab' – Special kebap meat marinated in spices and served with eggplant (aubergine), hot pide bread and a yogurt sauce. Ramazan kebabı, 'Ramadan kebab' – Meat mixed with yogurt, tomato and garlic stuffed with fresh mint or garnish on Pide bread. Shish kebab – Prepared with fish, lamb or chicken meat on thin metal or reed rods, grilled. Şiş tavuk or Tavuk şiş – Yogurt-marinated chicken grilled on a stick. Sivas kebabı – Associated with the Sivas region, similar to Tokat kebab but especially lamb ribs are preferred and it also differs from Tokat kebabı on the point that there are no potatoes inside. Susuz kebap, 'waterless kebab' – Cooked after draining excess fluid from the meat rubbed with salt and cinnamon in saucepan. Talaş kebabı, 'sawdust kebab' – Diced lamb, mixed with grated onions, brown meat mixed with flour dough. Tandır kebabı, 'tandoor kebab' – Lamb pieces (sometimes a whole lamb) baked in an oven called a tandır, which requires a special way of cooking for hours. Served with bread and raw onions. Tas kebabı, 'bowl kebab' – Stewed kebab in a bowl, beginning with the cooking of the vegetables in butter employing a method called yaga vurmak, ("butter infusion"), before the meat itself is cooked in the same grease. Testi kebabı, 'earthenware-jug kebab' – Ingredients are similar to çömlek kebabı, prepared in a testi instead of a güveç, generally found in Central Anatolia and the Mid-Western Black Sea region. Tokat kebabı – Associated with the Tokat region, it is made with veal marinated in olive oil, aubergine, tomatoes, potatoes, onion, garlic and special pita bread. Urfa kebabı – is similar to Adana kebabı, but not that spicy. Turkey is surrounded by seas which contain a large variety of fish. Fish are grilled, fried or cooked slowly by the buğulama (poaching) method. Buğulama is fish with lemon and parsley, covered while cooking so that it will be cooked with steam. The term pilâki is also used for fish cooked with various vegetables, including onion in the oven. In the Black Sea region, fish are usually fried with thick corn flour. Fish are also eaten cold; as smoked (isleme) or dried (çiroz), canned, salted or pickled (lâkerda). Fish is also cooked in salt or in dough in Turkey. Pazıda Levrek is a seafood speciality which consists of sea bass cooked in chard leaves. In fish restaurants, it is possible to find other fancy fish varieties like balık dolma (stuffed fish), balık iskender (inspired by İskender kebap), fishballs or fish en papillote. Fish soup prepared with vegetables, onion and flour is common in coastal towns and cities. In Istanbul's Eminönü and other coastal districts, grilled fish served in bread with tomatoes, herbs and onion is a popular fast food. In the inner parts of Turkey, trout alabalık is common as it is the main type of freshwater fish. Popular seafood mezes at coastlines include stuffed mussels, fried mussel and fried kalamar (squid) with tarator sauce. Baklava is prepared on large trays and cut into a variety of shapes. Sütlaç, or Turkish rice pudding. Kazandibi, means the bottom of "kazan" because of its burnt surface. One of the world-renowned desserts of Turkish cuisine is baklava. Baklava is made either with pistachios or walnuts. Turkish cuisine has a range of baklava-like desserts which include şöbiyet, bülbül yuvası, saray sarması, sütlü nuriye, and sarı burma. Kadaif ('Kadayıf') is a common Turkish dessert that employs shredded yufka. There are different types of kadaif: tel (wire) or Burma (wring) kadayıf, both of which can be prepared with either walnuts or pistachios. Although carrying the label "kadayıf", ekmek kadayıfı is totally different from "tel kadayıf". Künefe and ekmek kadayıfı are rich in syrup and butter, and are usually served with kaymak (clotted/scrambled butter). Künefe contains wire kadayıf with a layer of melted cheese in between and it is served hot with pistachios or walnuts. Among milk-based desserts, the most popular ones are muhallebi, su muhallebisi, sütlaç (rice pudding), keşkül, kazandibi (meaning the bottom of "kazan" because of its burnt surface), and tavuk göğsü (a sweet, gelatinous, milk pudding dessert quite similar to kazandibi, to which very thinly peeled chicken breast is added to give a chewy texture). A speciality from the Mediterranean region is haytalı, which consists of pieces of starch pudding and ice cream (or crushed ice) put in rose water sweetened with syrup. Helva (halva): un helvası (flour helva is usually cooked after someone has died), irmik helvası (cooked with semolina and pine nuts), yaz helvası (made from walnut or almond), tahin helvası (crushed sesame seeds), kos helva, pişmaniye (floss halva). Other popular desserts include; Revani (with semolina and starch), şekerpare, kalburabasma, dilber dudağı, vezir parmağı, hanım göbeği, kemalpaşa, tulumba, zerde, höşmerim, paluze, irmik tatlısı/peltesi, lokma. Güllaç is a dessert typically served at Ramadan, which consists of very thin, large dough layers put in milk and rose water, served with pomegranate seeds and walnuts. A story is told that in the kitchens of the Palace, those extra thin dough layers were prepared with "prayers", as it was believed that if one did not pray while opening phyllo dough, it would never be possible to obtain such thin layers. Aşure can be described as a sweet soup containing boiled beans, wheat and dried fruits. Sometimes cinnamon and rose water is added when being served. According to legend, it was first cooked on Noah's Ark and contained seven different ingredients in one dish. All the Anatolian peoples have cooked and are still cooking aşure especially during the month of Muharrem. Some traditional Turkish desserts are fruit-based: ayva tatlısı (quince), incir tatlısı (fig), kabak tatlısı (pumpkin), elma tatlısı (apple) and armut tatlısı (pear). Fruits are cooked in a pot or in an oven with sugar, carnations and cinnamon (without adding water). After being chilled, they are served with walnuts or pistachios and kaymak. Homemade cookies/biscuits are commonly called kurabiye in Turkish. The most common types are acıbadem kurabiyesi (prepared only with eggs, sugar and almonds), un kurabiyesi (flour kurabiye) and cevizli kurabiye (kurabiye with walnuts). Another dough based dessert is ay çöreği. Tahin-pekmez is a traditional combination especially in rural areas. Tahin is sesame paste and pekmez is grape syrup. These are sold separately and mixed before consumption. Lokum (Turkish delight), which was eaten for digestion after meals and called "rahat hulkum" in the Ottoman era, is another well-known sweet/candy with a range of varieties. Cezerye, cevizli (walnut) sucuk (named after its sucuk/sujuk like shape, also known as Churchkhela in Circassian region) and pestil (fruit pestils) are among other common sweets. Marzipan badem ezmesi or fıstık ezmesi (made of ground pistachios) is another common confection in Turkey. Another jelly like Turkish sweet is macun. Mesir macunu of Manisa/İzmir (which was also called "nevruziye" as this macun was distributed on the first day of spring in the Ottoman Palace) contains 41 different spices. It is still believed that "mesir macunu" is good for health and has healing effects. As with lokum, nane macunu (prepared with mint) used to be eaten as a digestive after heavy meals. Herbs and flowers having curative effects were grown in the gardens of Topkapı under the control of the chief doctor "hekimbaşı" and pharmacists of the Palace who used those herbs for preparing special types of macun and sherbet. There are also several types of ice creams based on salep powder or Cornstarch with Rose water such as Dondurma (Turkish gum ice cream), dried fruit ice cream, ice cream rose petals. Dried fruit, used in dolma, pilav, meat dishes and other desserts is also eaten with almonds or walnuts as a dessert. Figs, grapes, apricots are the most widespread dried fruits. Kaymak (clotted cream-butter) is often served with desserts to cut through their sweetness. Turkish tea or Turkish coffee, with or without sugar, is usually served after dinner or more rarely together with desserts. Although the majority of Turks profess the Islamic religion, alcoholic beverages are as widely available as anywhere. However, some Turks abstain from drinking alcohol during the holy month of Ramadan. Rakı (pronounced [ɾaˈkɯ]) is the most popular alcoholic drink in Turkey. It is considered as the national alcoholic beverage of Turkey. There are a few local brands of lager such as Bomonti, Marmara34 and Efes Pilsen and a small selection of international beers that are produced in Turkey such as Skol, Beck's, Miller, Foster's, Carlsberg and Tuborg. There are a variety of local wines produced by Turkish brands such as Sevilen, Kavaklıdere, Doluca, Corvus, Kayra, Pamukkale and Diren which are getting more popular with the change of climatic conditions that affect the production of wine. A range of grape varieties are grown in Turkey. For the production of red wine, the following types of grapes are mainly used; in the Marmara Region, Pinot noir, Adakarası, Papazkarası, Semillion, Kuntra, Gamay, Cinsault; in the Aegean Region, Carignane, Çalkarası, Merlot, Cabernet Sauvignon, Alicante Bouschet; in the Black Sea Region and the eastern part of the country, Öküzgözü, Boğazkere; in Central Anatolia, Kalecik Karası, Papazkarası, Dimrit; in the Mediterranean Region, Sergi Karası, Dimrit. As for white wine, the grapes can be listed as follows; in the Marmara Region, Chardonnay, Riesling, Semillion, Beylerce, Yapıncak; in the Aegean Region, muscat and semillion; in the Black Sea Region, Narince; in Central Anatolia, Emir, Hasandede (for further info http://www.hayyam.com/uzumler/index.php[permanent dead link]). In addition to mass production, it is quite popular to produce wines in private farms and sell them in the locality. Visitors can find different "home made" wines in Central Anatolia (Kapadokya/Cappadocia region - Nevşehir), the Aegean coast (Selçuk and Bozcaada (an island in the Aegean Sea)). At breakfast and all day long Turkish people drink black tea (çay). Tea is made with two teapots in Turkey. Strong bitter tea made in the upper pot is diluted by adding boiling water from the lower. Turkish coffee (kahve) is usually served after meals or with dessert. Ayran (yogurt drink) is the most common cold beverage, which may accompany almost all dishes in Turkey, except those with fish and other seafood. It's a mix of yogurt and water, similar to lassi. It may be served with salt, according to taste. Şalgam suyu (mild or hot turnip juice) is another important non-alcoholic beverage which is usually combined with kebabs or served together with rakı. Boza is a traditional winter drink, which is also known as millet wine (served cold with cinnamon and sometimes with leblebi). Sahlep is another favorite in winter (served hot with cinnamon). Sahlep is extracted from the roots of wild orchids and may be used in Turkish ice cream as well. This was a popular drink in western Europe before coffee was brought from Africa and came to be widely known. Limonata (lemonade) is very popular. It is traditionally served with baklava and other sweets. Sometimes lemonade is served with strawberry flavoring. This is called çıleklı lımonata. Sherbet (Turkish şerbet, pronounced [ʃeɾˈbet]) is a syrup which can be made from any of a wide variety of ingredients, especially fruits, flowers, or herbs. Examples include pears, quinces, strawberries, apples, cornelian cherry, pomegranates, oranges, rose petals, rose hips, or licorice and spices. Sherbet is drunk diluted with cold water. In classical Turkish cuisine, hoşaf (from the Persian "Khosh-ab", meaning "fresh water") alternatively accompanies meat dishes and pilav (pilaf). ^ İlkin, Nur; Kaufman, Sheilah (2002). A Taste of Turkish cuisine. Hippocrene Books. ISBN 978-0781809481. Retrieved 2017-12-12. ^ Aarssen, Jeroen; Backus, Ad (2000). Colloquial Turkish. Routledge. p. 71. ISBN 978-0-415-15746-9. Retrieved 2009-04-15. ^ a b Kia, Mehrdad (2011). Daily Life in the Ottoman Empire. ABC-CLIO. p. 225. ISBN 9780313064029. ^ a b c d e f g h i j k l m n o p Akin, Engin (2015-10-06). Essential Turkish Cuisine. Abrams. ISBN 978-1-61312-871-8. ^ a b c d e f g h i j k Basan, Ghillie (1997-04-15). Classic Turkish Cooking. Macmillan. ISBN 978-0-312-15617-6. 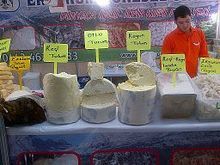 ^ a b c "Turkish Cheeses". 2 June 2005. Archived from the original on 15 January 2013. Retrieved 2007-12-07. ^ a b Perry, Charles. "The Taste for Layered Bread among the Nomadic Turks and the Central Asian Origins of Baklava", in A Taste of Thyme: Culinary Cultures of the Middle East (ed. Sami Zubaida, Richard Tapper), 1994. p. 89. ^ a b NTV MSNBC. "Charles Perry:Baklava Türk tatlısıdır" (in Turkish). Archived from the original on 2011-10-07. Retrieved 2009-03-31. ^ a b Arab Studies Journal. Georgetown University. 2001. p. 115. Retrieved 2009-03-31. ^ a b Ken Albala (2011). Food Cultures of the World Encyclopedia. ABC-CLIO. pp. 307–. ISBN 978-0-313-37626-9. Gürsoy, Deniz, Turkish Cuisine in Historical Perspective, Istanbul, 2006, ISBN 975-329-564-2. Halıcı, Nevin, Konya Yemek Kültürü ve Konya Yemekleri, Istanbul 2005, ISBN 975-6021-16-0. Halıcı, Nevin, Sufi Cuisine, Saqi 2005. Lambraki, Mirsini & Akın, Engin, Aynı Sofrada İki Ülke, Türk ve Yunan Mutfağı, Istanbul 2003, ISBN 975-458-484-2. Roden, Claudia, A New Book of Middle Eastern Food, 2000, ISBN 0-14-046588-X. Şavkay, Turgut, Halk Mutfağımız Geleneksel Tatlarımızdan Seçmeler, Istanbul 2005, ISBN 975-98180-2-7. Ünsal, Artun & Süt, Uyuyunca, Türkiye Peynirleri, Istanbul, ISBN 975-363-755-1. Ünsal, Artun & Silivrim, Kaymak, Türkiye'nin Yoğurtları, Istanbul 2007, ISBN 978-975-08-1276-7. Yerasimos, Marianna, Osmanlı Mutfağı, Istanbul 2002; published in English as 500 Years of Ottoman Cuisine. Zubaida, Sami & Tapper, Richard, A Taste of Thyme: Culinary Cultures of the Middle East, London and New York, 1994 and 2000, ISBN 1-86064-603-4. 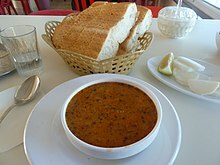 Wikimedia Commons has media related to Cuisine of Turkey.